We petition our policymakers—from government officials to intergovernmental institutions—to fight cultural racketeering around the world. 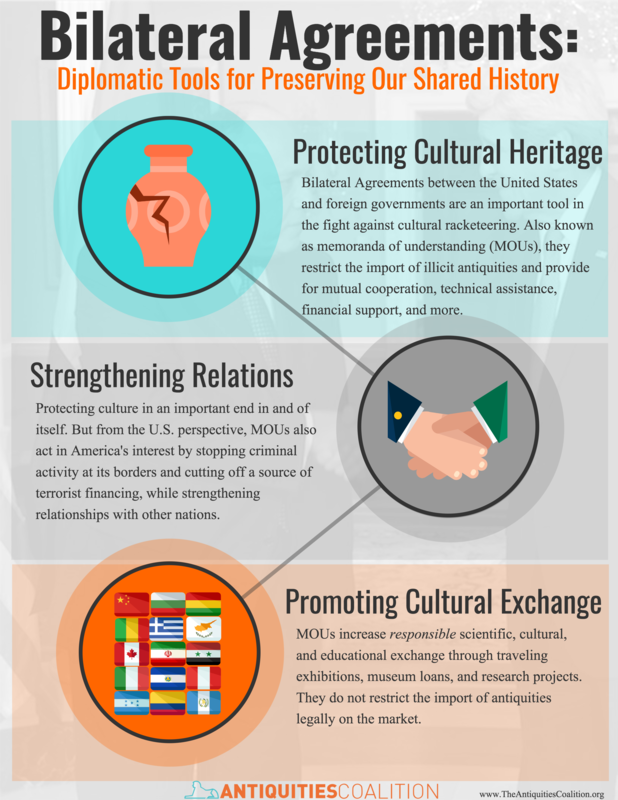 Bilateral agreements between the United States and foreign governments are proactive steps that can be taken to combat illicit antiquities trafficking. These cultural memoranda of understanding (MOUs) restrict the import of their illegally exported cultural property into the United States. You can learn more from our Chairman and Founder Deborah Lehr, who has published a very informative article for Huffington Post on Cultural Memoranda of Understanding: An Important Diplomatic Tool for Protecting Heritage. Bilateral agreements, otherwise known as memoranda of understanding (MOUs), between demand (“market”) countries and supply (“source”) countries, are an effective tool in discouraging the illicit trade in antiquities. Many foreign governments are unaware that this MOU option is required to implement the 1970 UNESCO Convention or do not understand how to pursue it. The United States should proactively educate foreign nations about bilateral agreements, including why they are needed, how they work, and what the application process is. This is especially important for countries whose cultural heritage is at risk (or soon be at risk) from armed conflict or violent extremist organizations. It is critical that the MOU process is transparent to all, and handled in an efficient and effective manner. The Convention on Cultural Property Implementation Act (CPIA), gives the President the authority to enter into agreements to restrict the U.S. import of designated archaeological and ethnological material. To date, the United States has signed MOUs with 17 nations and imposed emergency actions with similar terms for Iraq and Syria. However, these emergency actions aside, Egypt and Libya are the only MENA nations with bilateral agreements with the United States. Given the ongoing crises in the region—and the threat they pose to both our shared history and global security—this must change. These MOUs benefit all parties. MOUs serve the United States’ interest in decreasing international criminal activity while strengthening relationships with its allies. The Illicit Art and Antiquities Trafficking Protection Act (H.R. 5886) — which Congressman Luke Messer introduced to the House of Representatives on May 18, 2018 — will help to close the $26.6 billion American art market to money laundering, terrorist financing, and other crimes. This bill will remove art and antiquities dealers’ current exemption from the Bank Secrecy Act (BSA), which requires businesses “whose cash transactions have a high degree of usefulness in criminal… matters” and other financial institutions to assist the U.S. government in detecting and preventing financial crimes. Dealers in precious metals, stones, and jewels are already subject to the BSA, as are sellers of automobiles, planes, and boats, casinos, pawnbrokers, real estate professionals, and travel agencies. But to date, the multi-billion art market has been excluded— despite warnings from economists, law enforcement, and prosecutors that criminals are taking advantage of this loophole. Congressman Messer’s measure to amend the BSA is now under review by the House Financial Services Committee, which has jurisdiction over issues pertaining to the economy, as well as efforts to combat terrorist financing. On December 22, 2015, the Antiquities Coalition wrote U.S. Treasury Secretary Lew, urging him to take immediate action through executive order to halt the import of blood antiquities. Secretary Jack Lew took the unprecedented step in December 2015 to call together Ministers of Finance from the Security Council members of the United Nations to reach consensus around stopping access to the member states’ markets as a source of funding for Daesh. As a step to ensure that the United States is in full compliance with the Resolution 2199 on its year anniversary, Treasury should move without delay and close the U.S. market to all sources of funding, particularly blood antiquities, for Daesh and related extremist organizations. Given this precedent, and using these existing laws to disrupt the financial support networks of terrorist organizations, the Antiquities Coalition urged the United States to extend the petroleum restrictions to Syrian antiquities. On April 22, 2015, the Antiquities Coalition joined in issuing a letter of support to pass the Protect and Preserve International Cultural Property Act. The Protect and Preserve International Cultural Property Act—signed into law by President Obama on May 9, 2016—restricts the import of Syrian antiquities illegally removed from the country after March 15, 2011, building upon the restrictions in place for Iraqi antiquities since 2004.